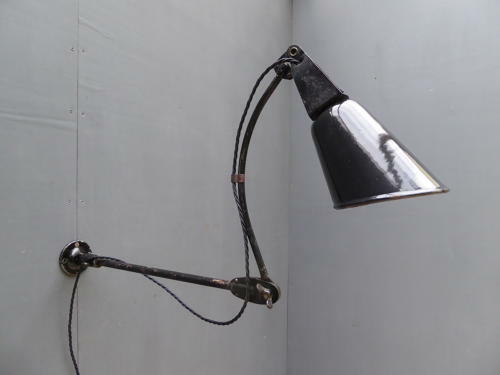 A fantastic example of a vintage industrial 'Localite' lamp by Walligraph. A wonderfully simple industrial lamp with a cast base and articulated arm supporting its original tapered black & white enamel shade. In original factory paintwork which boasts a good age related patina. Can be mounted horizontally or vertically & used as a wall light or desk / table lamp. Wear commensurate with age, good overall condition. Height given (95cm) refers to the lamp at full stretch. UK courier service available at £13, tracked & signed for 24 hour delivery.